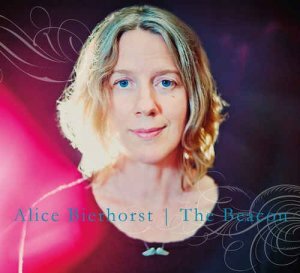 Alice Bierhorst's wondrous, expressive voice serve her timeless songs, indebted to the Brill Building brilliance of Burt Bacharach and Carole King/Gerry Goffin, with a dash of classic Broadway, lieder and seventies soft rock. Alice Bierhorst is a singer and songwriter who has spent her life honing her craft. "The Beacon" is her fifteenth album. Made with The Universal Thump, producers Greta Gertler Gold and Adam Gold, these songs bring together all of her divergent influences: Brill Building pop, Tin Pan Alley, lieder, and seventies soft rock among others, in a lustrous chamber pop setting. "In the world of music, sincerity is often overlooked. And that's too bad, because...at least for us...sincerity in music is one of the things that we're always searching for. If you have a similar desire, you may very well find yourself drawn to the impressively personal songs on The Beacon. Alice Bierhorst dedicated the album to the memory of her mother. In spinning these tracks, you can easily pick up on the personal references and the affection that Alice had for her mom. Interestingly, this album was produced by Greta Gold and Adam Gold of The Universal Thump (one of our favorite up-and-coming pop duos). Bierhorst is no newcomer to the world of music. She has recorded and released fourteen albums now (! ), the first of which she created when she was only fourteen years old. All those years of work and experience have paid off, as Ms. Bierhorst is now thoroughly focused on her art. This album features ten tracks, all of which feature impeccable arrangements and lyrics that seem to come straight from the heart. Intelligent reflective tracks include "Our Work is Never Done," "Not Like The Movies," and "Goodbye, My Voyager."